It is with great pride, as your new UFT Chapter Leader, that I welcome you to the Speech Chapter website. This website will be updated on a regular basis to keep members informed about events, your rights and our accomplishments. Please check in frequently and sign up with the UFT Membership Department (212-598-6855) to receive emails from our chapter and the UFT. Many issues and concerns arise repeatedly in our chapter. Our monthly meetings are an opportunity to learn what is happening in the schools, to answer your questions and to help resolve your problems. 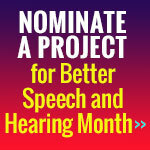 Our Better Speech and Hearing Month (BSHM) celebration will be held on Thursday, May 30, 2019. I, along with the BSHM committee, look forward to seeing and sharing all the projects from students and therapists. Please start thinking of ideas and be ready to submit your work by March 22, 2019. As your chapter leader, not only am I here to support your needs but the entire UFT is ready to help you. Every borough office is open until 6pm. Please feel free to call the general number 212-777-7500 to ask for specific departments to answer your non-speech related questions (i.e. pension, health). Your assistant chapter leader, Brenda Caquias, and I are here to answer your speech-related questions and help you make informed choices through the speech chapter hotline, Monday through Friday, from 4 to 6 p.m. at 212-598-7774 or leave a voice message at any time and your call will be returned. In addition, you can also send a succinct email to cmurphy@uft.org which will be answered promptly.